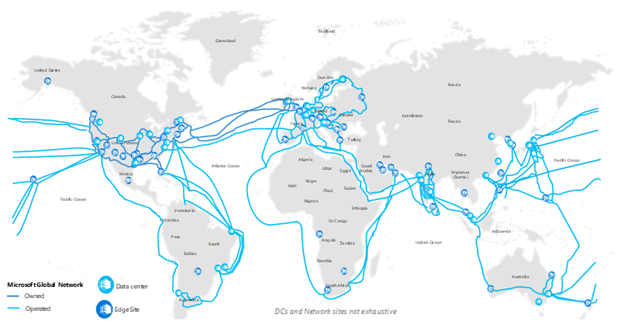 Back in May during Microsoft Build, we made our own Content Delivery Network available to Azure customers. Building on our years of experience scaling enterprise-class services, opening up access to this vast amount of infrastructure previously not accessible to customers was a significant milestone for us. In line with our mission to offer the broadest possible range of choice and options when deploying and scaling your web apps using Azure, Microsoft’s own CDN was a natural expansion supplementing our world class partners Akamai and Verizon. Azure CDN provides a world class platform to let you reduce load times, save bandwidth, and speed responsiveness across your businesses diverse workflows. Azure CDN from Microsoft enables Azure customers to use and deliver content from the same global CDN network leveraged by Microsoft properties such as Office 365, Skype, Bing, OneDrive, Windows, and Xbox. Connectivity within Microsoft’s network along with new Regional Caching capabilities enables more consistent, more predictable cache fill performance by providing multi-tier caching along direct, private access to content in Azure from each CDN edge point of presence (POP). Azure CDN from Microsoft entered public preview providing access to 54 global Edge POPs in 33 countries and 16 Regional Cache POPs. Today we’re happy to announce eight additional point-of presence (POP) locations also adding three new countries to our global coverage. Get started with the Azure CDN from Microsoft today! If you are interested in exploring capabilities beyond the standard offerings, please contact us at [email protected].